Pocatello City Hall is located at 911 North 7th Avenue, Pocatello, ID 83201; phone: 208-234-6582. Photo: Standrod House, ca. 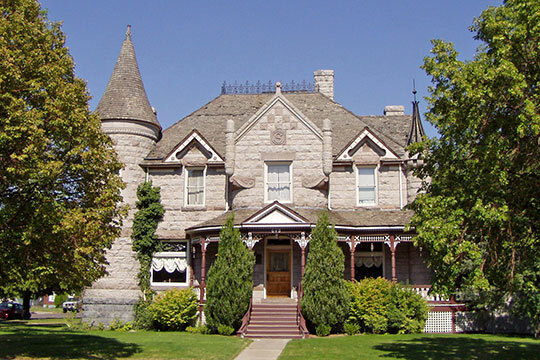 1902, 648 North Garfield Avenue, Pocatello, ID. Listed on the National Register of Historic Places in 1973. Photographed by user:Eric Kjaemperud (own work), 2012, [cc-by-3.0 (creativecommons.org/licenses/by/3.0)], via Wikimedia Commons, accessed May, 2015. Pocatello was platted when the Oregon Short Line (OSL) Railroad, a subsidiary of the Union Pacific Railway, built tracks to the area in 1882. The OSL did not originally intend to establish a town at the location (called Pocatello Junction), but was building through from Granger, Wyoming, to Huntington, Oregon. At Pocatello the OSL tracks crossed tracks coming north from Utah on the Utah & Northern Railroad, a line built to connect Utah with the mining communities of Montana. Although Pocatello was a stop with a water tank and a makeshift depot, OSL officials planned to set up headquarters and repair shops at McCammon, located about twenty miles southwest of Pocatello, on land purchased from rancher H.O. Harkness. When Harkness and railroad representatives were unable to agree on the sale, the OSL decided to establish headquarters at Pocatello, which required negotiating with the tribes of the Fort Hall Indian Reservation for a railroad right-of-way and room for a depot and some additional buildings. In 1882, the company purchased 40 acres and built a small freight depot. Railroad workers lived in tents and boxcars along the tracks. Railroad operations at Pocatello grew as the junction served as a distribution point for travelers and freight. By 1883, the railroad had constructed the two-story Pacific Hotel to accommodate overland travelers who disembarked at Pocatello Junction. Increased operations, especially the removal in 1887 of the railroad shops from Eagle Rock (now Idaho Falls) to Pocatello, brought in more workers. Within a few short years resident workers were illegally squatting on reservation land surrounding the original 40 acres. Many of the workers had brought their families with them and desired to establish permanent homes at Pocatello. In 1886, 41 residents signed a petition, which was sent to the Secretary of the Interior, begging for an accommodation to build houses on the reservation land. Under pressure from the railroad and its employees, Congress negotiated the purchase of an additional 1,840 acres of land from the Fort Hall tribes and passed the Pocatello Townsite bill authorizing the purchase in 1888. The townsite was surveyed in 1889 and lots were sold at auction in 1891. Pocatello's relationship with the railroad ensured its continued growth in size and regional importance, but other developments also helped secure its position as a regional center. In 1890, Pocatello incorporated as a village in Bingham County. In 1893, when the state legislature voted to split Bingham County and create Bannock County, Pocatello was named county seat. In 1901, the town was selected as the site of the Academy of Idaho, a state institution that began as a high school but evolved over the years into Idaho State University. That same year, an additional section of the Fort Hall Reservation was opened to settlement. The land located south and east of Pocatello, toward McCammon, was opened to settlement with a land run in July, 1902, and Pocatello's need for more land was solved. As Pocatello gained stature as a central community, it also gained business and industry. Progress was made despite a long struggle to develop a consistent, clean, and safe supply of water, a problem that caused much grief until 1914 when a court decision awarded ownership of the water supply system to the City of Pocatello. Many businesses and a few small industries were established by 1905, including brick plants, planing mills, a meat-packing plant, and others. The J.C. Kraft brothers relocated their plant to Pocatello from San Francisco in 1924, and by 1925, a printing plant, a flour mill and a bakery were among the growing number of businesses and factories in operation. In 1889, using a standard system, General Land Office surveyor, Samuel G. Rhoades laid out Pocatello with the railroad tracks at the center and streets platted on both sides perpendicular and parallel to the tracks. This initial layout formed the basis for the development of Pocatello as two separate but united communities — Eastside and Westside. For the first few years of the town's existence, the Eastside was seen as the marginal area, where immigrant and minority workers lived and where cheap lodging and low class entertainment were available to transient workers and traveling salesmen. A few businesses also developed on the Eastside, but gradually the business district began to grow on the Westside, in relation to the Pacific Hotel, for many years Pocatello's most prominent landmark building. Community leaders and prominent citizens tended to build their houses just to the west of the business district. Pocatello's growth continued through the 1890s, despite the slowdown of the national economy following the Panic of 1893. Pressure was exerted to make even more reservation land available for settlement. In 1900, an additional 416,000 acres of reservation land was ceded to the federal government; that land was opened to settlement in June, 1903, with a land rush. In July, remaining lands within five miles of Pocatello were sold at auction. By 1910, the area of town west of the tracks and east of the Portneuf was filled with residences and businesses. Elizabeth P. Jacox, historian, The Arrowrock Group, Inc., Lincoln-Johnson Avenue Residential Historic District, nomination document, 2005, National Park Service, National Register of Historic Places, Washington, D.C.